The pricing of mobile phone deals can lead to some very strange occurrences. As phones get older their price tags rise and fall sporadically, occasionally giving us a gem of a deal. Just like this one - Samsung Galaxy S9 Plus deals are currently available at the same price as the smaller, not quite as powerful S9. It's a strange concept - how could the larger, more powerful and feature-filled phone be the same price as the minier, cheaper version? 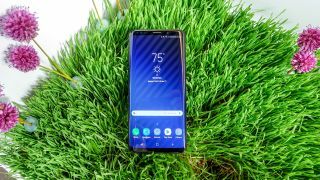 Occasionally these things happen and we've learnt to not question them too much, instead rejoice in the saving you could be getting on a brilliant Samsung phone deal! Where these clashing prices is most evident is actually our picks for the best deals on both devices. The same amount of data, the same monthly cost but the S9 Plus costs £1 less upfront. We've listed the best S9 Plus offers down below with the nearest Galaxy S9 deal with it so you can compare the price difference at each level of data.